No masters category this year, so there was no opportunity to defend my overall win last year in M1/2/3. Given most masters riders would be allocated B grade, I requested A grade for this tour so I'd get a hiding from the really fast guys! The standard theory is that you 'drop down' one grade for 'open' events, I'm not sure the reasoning as the same people race opens as club and combine events. What this leads to is a drain of numbers from A grade, with only 20 entered in this years field. A grade contained a few riders I knew, so it was going to be a good one. 6.7kms on a nice surface, up up up - false flat - up up up, and that's it. 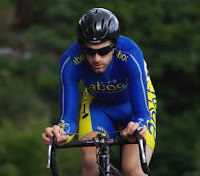 I'd won the M1/2/3 eastern region 1:20 time trial back in late September with a time of 14:29, a PB in power and time. I'd have been happy to match that in stage 1 which would put me mid-field. We arrived and got a car park away from the registration and everyone else. I was able to get in a good warm up - roll to the line - and let fire. No time for socialising. Just get there, do the job, then recover for stage 2 later that day. I'll spare the details of every turn of the pedal, but it all went relatively well. PB time of 14:10. 4th position overall, with Jono taking 1st on the stage with a 13:47. So 5th on GC - and only a handful of points separating the top 10. Still anyone's race, but with a Blackburn team member holding onto GC it'd be another day of team racing vs individuals. Who'd make the break with the nominated team member? Reece was jumping to attack and within a few minutes he was away with three others. I can't recall seeing a Blackburn team rider in the mix, but they weren't chasing so they must have been backing themselves for GC. The break lapped us (1km circuit) at around the 25min mark, so it was going to be an easy ride from here on in. I just wanted to survive with the bunch and try my luck in the sprint. A few accelerations off the front were brought back by the Blackburn team and a few others, I was just happy sitting on the back getting pulled around. At 48mins over the loud speaker I hear "Last lap for lapped riders". Wowa, awesome. I jump! A few others come with - I cross the line in second and wonder where that places me? We all sit up and look around, nobody knows what is going on - we keep riding. Jono tells me the message on the loud speaker was "Last lap for lapped riders, on the red flag". Oh, ok then. My mistake I guess? I sit in the bunch again and look for the flag on the next few laps. 55mins its out - The red flag is held out to the riders. We all move into line. Looks like Blackburn is going to lead this one out. I have to make sure I don't get to the line between Jono and #11 (Blackburn team rider holding GC). Around the final bend I jump and get clear of the bunch. To the line - push push push - wait... The red flag is still out, but now they're blowing a whistle and screaming "One to go". What the F*$K? I was told later the spectators didn't have any idea either, so it wasn't just my hearing. So at this point I'm clear of the bunch with a rider on my wheel. I keep pushing but I don't have much left. The rider on my wheel says I can take it, and to keep pushing. I do - then swing my arm for him to pull a turn. Just one turn... All I needed was a short 10-20 second sit on second wheel while we held the gap and I'd have launched again. He doesn't come through. We're swallowed up by the swarming bunch and I tag on the back as they rip past. I end up a few lengths off the back, but still ahead of a few riders. So in the wash up of the sprint I heard that the Blackburn team were all to be relegated to rear of field for either team riding the stage/event or having a rider sit up in the bunch sprint causing issues. We were not told specifically the relegation was for or about, but this wasn't at all a surprise to the individuals who had been 'team raced' within A grade over the last two stages. Final GC was a three-way tie with the count-back going to Jono Lovelock for his blistering time trial ride. Good report of what look like some great racing! Sorry, but how come you ride Masters as a 30 y.o.? In QLD, it starts with 34+ riding Masters 2. Anyone younger rides A, B or C.
You might be in B Grade for Bright as they don't have Masters 1. Good Luck in Bright...and good race report for the Dougherty...Team Racing in loal crits is ridiculous....but if it was a group of girls temaing together against the boys...then I would be ok with that.